The Business Outreach and Services department has provided customized training programs to our employers in Three Rivers and Sturgis and surrounding area for more than 40 years. We can help you gain a competitive advantage in a challenging global marketplace through use of our ability to bring training to your site, assessment services, extensive instructor resources and flexible options for scheduling training and our state-of-the art facilities. 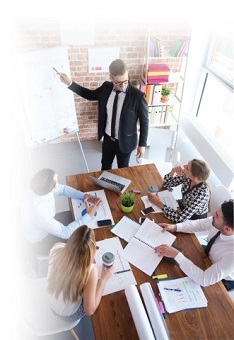 GOCC customized training programs not only give your employees with the skills to improve performance and deliver results, it also elevates morale by demonstrating your commitment to their success. When is Customized training the right solution for your company? No current Upcoming Offerings, but check back soon for updates. At Glen Oaks you can receive the hands-on training you need to both understand and apply relevant manufacturing/business principles in a variety of training topics offered at the college. What follows below is a list of training topics to aid you in your planning. Please keep in mind that many of these topics are general in nature and may require joint discussion with GOCC to develop a plan that will meet your organization’s special needs. There are also many other training topics not included in which we can assist. Click on the topics to review the outline. Any of these topics can be customized to meet your specific needs. What follows is a list of training topics to aid you in your planning. Please keep in mind that many of these topics are general in nature and may require joint discussion with GOCC to develop a plan that will meet your organization’s special needs. There are also many other training topics not included on this list. Please feel free to contact Paul Aivars for help with your company’s training needs.